You are here: HomenextPlacesnextStreetsnextLewes RoadnextLucky 13? Regular contributor Paul Clarkson sent us the photograph here of an interesting shop front in Lewes Road. He wanted to know if it was possible to find out about the history of the business. I contacted our online local historian Andy Grant who suggested that, in view of its date, it might be an idea to apply for a preservation order for the shop’s signage. Apparently it is a rare case of surviving original 19th century retail architecture. Andy also provided the following information. As Brighton’s urban sprawl spread northwards, the open fields to either side of Lewes Road were turned over for development. The buildings along the section pictured were commenced towards the latter half of the 1850s. Initially number 13 was residentially occupied, firstly by Mary Ann Englefield, and then from 1862 by an elderly widow named Frances Deavin. In 1873 the property was converted to a shop by a boot-maker named Charles Falck. By 1882, another Boot & Shoemaker by the name of Richard Cruyes Hallett had taken over the shop – this is the name featured on the signage. Hallett remained in occupation until 1906, and went on to become the Superintendent of the Victoria Public Baths after giving up his trade as a boot-maker. He died at the end of 1926. but the shop continued as a Boot-makers until the end of the 1950s, after which it became a Fruiterers. During the 1970s it was known as the Lewes Road Fruit Store. That’s amazing. I really hope it doesn’t get changed or painted over. We need to keep as much history as possible. I have also tried to find out what business Hallett used to run. But have yet to find the name listed anywhere. However, it’s a fantastic sign and so glad the owners of the cafe have decided to keep it. If I do find out I shall let you know. Hi Carol, as I mentioned in the article, Hallett was a Boot and Shoemaker – if you look in directories between 1882 and 1906 his name is recorded at the shop at 13, Lewes Road. Regards, Andy. I contributed the picture above of 13 Lewes Road to the site as I have a particular interest in that area. My Mum was born at 35 St Paul’s Street where my Nan and Grandad lived with my Nan’s parents. They eventually moved to Moulsecoomb Way at the end of the ’30s. I have a photograph of my Great Grandparents with my Nan at about 6 months old taken in Henry Thomas Edwards Photographic Studio at 11 Lewes Road. I find it fantastic that my recent ancestors would have walked these streets and that my Grandad would have most probably used Number 13 Lewes Road to take his boots to be mended when it was a Boot and Shoemaker. Just a few shops along from this shop heading towards Elm Grove was a mini-supermarket we always knew it as Evershed & Marsh. They used to sell ham on the bone, it was just beautiful. They also sold a biscuit called Choc-o-Lait, they are not around these days although I still keep looking for them with no luck. Does anybody else remember this shop? Hi Rodney, I do remember the shop, and the ham and bacon. I lived at 7, Wellington Road, my Mother used to send me there with a shopping list as she was Greek and only just learning English. I had a friend who lived in Gladstone Terrace whose mother used to clean the little supermarket and she didn’t like being there on her own as she said the basement was haunted by a woman, so she took my friend, her daughter, with her for company. I did help them a couple of times but didn’t go again as I was scared. 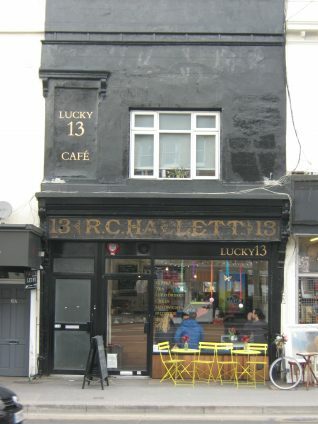 My great aunt, Ethel, was the daughter of my great grandfather Richard Cruyes Hallett – the Shoe and Bootmaker at 13 Lewes Road. Ethel’s sister was my grandmother who married Ernest Edward Blann (his son was my dad). I’m privileged to have inherited Ethel’s extensive postcard album dating back to 1904 and have decided to sort through the hundreds of postcards she collected and produce a publication of this album. Most of these are addressed to her at 13 Lewes Road, some to the Victoria Baths (where presumably her family moved to as well) and then to Queens Park Road later in life. This is proving to be an exciting discovery of the Hallett side of my family. Then finding, just today, your website – has given me a huge start in following the Hallett family tree, seeing what ‘postcard’ life was like in the early 1900s and an amazing sense of what I’m doing has some value for others. We’ll see how it all goes. I might just pop in to No. 13 with my wife and have a coffee.